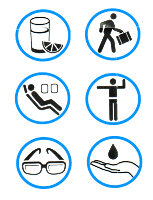 To help you arrive at your destination feeling relaxed and refreshed, regardless of whether you need to be rejuvenate for your holiday or effective at achieving your goals on a business trip, these simple tips will help you to enjoy your journey. Consult your doctor before traveling if you have any medical concerns about making a long journey, or if you suffer from a respiratory or cardiovascular condition. Plan for the destination – will you need any vaccinations or special medications? Get a good night’s rest before the flight. Allow yourself plenty of time for check-in, or check-in online prior your flight. Once through the departures try to relax as much as possible. Travel lightly - Carry only the essential items that you will need during your flight. Drink plenty of water - Rehydrate with water or juices frequently. Drink tea and coffee in moderation. Equalize ear pressure - Chewing and swallowing will help equalize your ear pressure during ascent and descent. Babies and young passengers may suffer more acutely with popping ears, therefore consider providing a dummy. Make yourself comfortable - Loosen clothing, remove jacket and avoid anything pressing against your body. Get as comfortable as possible when resting and turn frequently. Keep moving - Exercise your lower legs and calf muscles. This encourages blood flow. Avoid sleeping for long periods in same position. 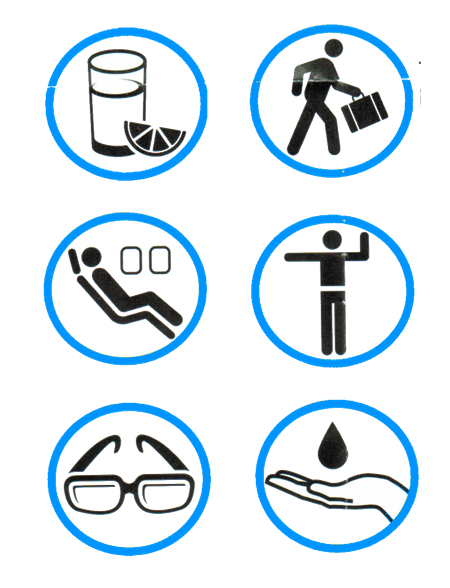 Wear glasses - Cabin air is drier than normal therefore swap your contact lenses for glasses. Use skin moisturizer - Apply a good quality moisturizer to ensure your skin doesn't dry out. Try some light exercises or read if you can not sleep after arrival.